There are two main venues used by StageSoc: The Annex, and the Nuffield Theatre. Further details regarding these venues, and others are available to StageSoc registered users in the gallery. 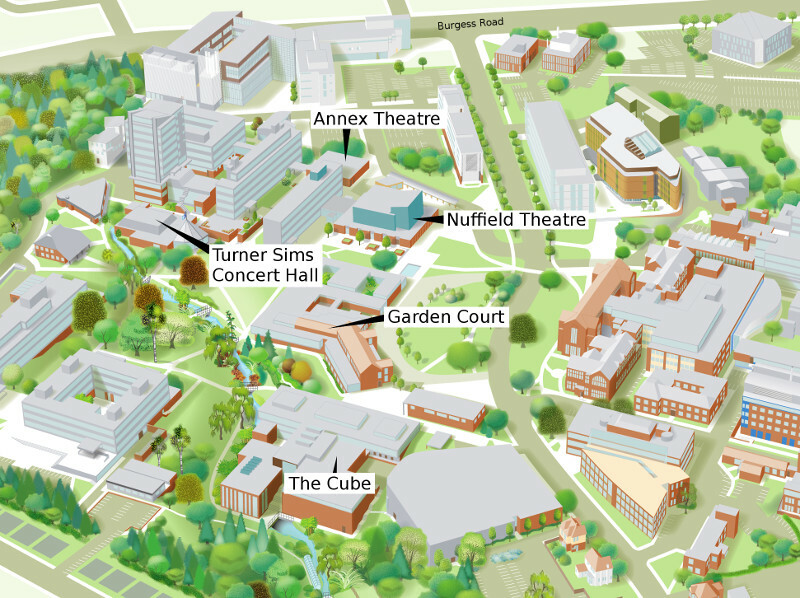 The map below shows the venues we use most frequently: The Annex (Bld.2a), The Nuffield (Bld.6), The Turner Sims (Bld.52), The Cube (Bld.42) and Garden Court (West Refectory) (Bld.40). The Annex is where most PA shows are held, and is where StageSoc members spend most of their time! The building consists of two lecture theatres, H and J, which are both used by the university during the day; H is used for shows and J is used as backstage space for cast and crew. There are a selection of CAD models of The Annex available in the StageSoc gallery. It is equipped with five IWBs (two of which are side bars) and 2 floor boxes, with 54 channels of lighting control, run from an ETC Element lighting console, of which there is an offline simulator available. There are some basic gobos and many Lee and (some) Rosco gels available. Two additional dimmers (24 and 12 channels) are available. Yamaha MG206C-USB (12 mic/line inputs + 4 mic/stereo inputs, 8 built-in compressors, 3 band EQ, 2 stereo groups, 4 aux busses). A relay system operates to feed sound from the main auditorium to the adjoining lecture theatre for cast listening. There is also the facility for a video relay of the stage, which is able to be projected in L/T J.
Cat5 and DMX runs to each LX bar and stageboxes. There are two 32A sockets on the stage right side. A Canford Techpro comms system also operates with cans sockets located in either stage wing and dedicated comms lines in the lighting and sound looms. The system is controlled via a distribution amplifier at the rear of the auditorium. Arts H capacity after the refurb is 143 for shows plus 6 opping seats, with 3 taken out by the LX opping table. (7 rows of 4+10+4, and one of 4+5+4 for audience; then rows of 4, 3 and 6 for opping & equipment). Home to at least one production by a PA society a year, the Nuffield Theatre always hosts some of StageSoc's most challenging productions. The Nuffield Theatre is a professional producing theatre, based at the Highfield Campus. As well as the theatre's own shows, it also hosts touring productions, and comedians such as Rich Hall, Lucy Porter and Ed Byrne. Find out What's On. The Nuffield Theatre uses an ETC Expression 3 lighting desk to control its 228 Strand LD90 dimmers (216x2.5Kw & 12x5Kw). 72 of these are patchable, whilst the remainder are hard-wired to sockets. There are also 36 non-dim circuits, controlled by a panel in the LX box. The theatre has a large stock of lanterns including: SILs, Source 4 Profiles, Patt. 743s, Tulla Litos, Patt. 243s, Coemar 2Ks, Codas and Irises. The normal LX operating position is in a control box positioned above the back of the auditorium. There are also control points in the centre of the auditorium (for production desk), and in Prompt Corner. The front-of-house PA is a K-Array system with infills and subs. There are also various other speakers and amps available, including Bose 802's with controller, and JBL Control 1's. A selection of sound desks are available, depending upon the requirements of the performance. These range from a Soundcraft Spirit Live4 12:4:2 to an Allen & Heath ML5000. There are also the Yamaha O2R (version 1) and DiGiCo SD9 digital sound desks. The DiGiCo SD9 comes standard with the Nuffield hire. Both digital desks and to a lesser extent the ML5000 can be MIDI controlled from a computer, allowing some automation of operation and backup of sound setting. There are several CD players and MiniDisc players and outboard signal processing (such as reverb units and equalizers. There is a small selection of microphones as heavy miking is not usually required in this space. There are, however, twelve Sennheiser EW300 G1 radio microphones, and two handheld radio microphones. There are numerous 'Facilities Panels' around the building, which have audio tie lines, speakon lines, BNC video lines, Ethernet lines and cans circuits, which run to a patch panel in the Sound box. This makes plugging up equipment anywhere around the venue relatively easy. The stage has two variable height forestages, which can be either orchestra pit, auditorium seating or stage. The LX and tab bars are single purchase counter-weighted and there are 20 hemp sets. There is a counter-weighted trap door. The prompt desk has the master cans station, controls for cue lights, and a stage video monitor. Calls to backstage and FOH can be made from here. Garden Court is owned by the University and operated by Catering, Conferences & Hospitality, and not SUSU, even through their building connects with it (as a result the SUSU facilities manager does not have keys to it). SUSU hires this space for gigs and live music. The West Ref has been used for the PA show and the Winter Revue in previous years. It is a long rectangular room with a partition wall down the house-left side. At the stage end (far end from main entrance) there is a small partition wall in the middle of the wall; this allows a wide doorway onto the back of the stage. Along both sides of the room are curtain tracks which hold grey curtains. These can cover the entire length of the room to change the look of the room; the curtains come in 8ft sections held together with Velcro. Around the stage end there is triangular truss mounted onto the ceiling, creating a rectangle around the edges of the stage. There is also one two-thirds of the way along the room (from the stage end) to hang face-light on. There is a cable trough mounted on the house-left wall (above the partition wall) into which socapex can be run. The dimensions of the room can be found here (Garden Court B). This is a multi-purpose venue within SUSU. It has two formats, a cinema with tiered seating and a projection screen, and as an empty room (mainly for a nightclub). At the back of the room is a balcony, level with the top tier of seating. This venue is sometimes used by StageSoc for events such as the PA variety show, as well as advanced training sessions. The room has a motorised class 2 truss suspended from the ceiling by 8 motors. This has a selection of intelligent lights installed (Mac 250s, RoboScan 918 Pros, RoboColor 400s, Wizards & Atomics). The truss is powered by a 63A 3-phase supply, which terminates in 20A powerconn sockets around the truss. The truss also has 8 Ethernet runs onto it, 8 (min 2 working) BNC runs, 4 DMX universes and one SoundWeb input. The power available in the room is 2 32A single phase MK commando sockets at "stage right" (when the cinema is in place), and 2 32A commando sockets on the balcony by the box end. There are two SoundWeb inputs on the cube floor, one in the centre under the projection screen and an input by the fire door opposite the main entrance (paralleled with a set the other side of the fire door). The installed sound consists of four D&B C7 tops, four C4 subs and a B2 infra-sub. Music events in this venue often requires SUSU's non-installed D&B rig to be used. The lighting booth is on the balcony (accessed via level 3), and has control over all installed lighting and sound systems. This is where the DMX runs to and is where the SoundWeb PC is located. Lighting is controlled by a touchscreen computer running Chamsys MacigQ software with a Maxi Wing and a Playback Wing. It is to be noted that next to the lighting booth is the UnionFilms projection booth, this is not to be entered under any circumstances. Also in the LX booth is the control PC for video (a.k.a. The Resolume PC), this drives projectors installed in the rig. Also in the box is a patch bay for installed BNC. There are two store rooms for stuff in the cube. The first is a cupboard by the main entrance (between the two sets of doors), called the cube store. This houses cables, DJ equipment and hardware usually used in the cube. Through the fire doors at the other end is the woodstore. This is where truss and scaff are kept. The Turner Sims is a concert hall in Campus where Jazzmanix concerts Pure Dance are held. It is designed for acoustic concerts and has little installed for technical shows. This folder contains a plan of the installed rig, a Chamsys show file for controlling the installed lighting rig (universe 2) and house lights (universe 3), and various CAD files. The venue has 4 installed lighting bars: stage left and right on the sides of the stage (against the wall) and level with the front, and two bars against the back wall (one on each side). All the bars are approximately 4m above the stage. In the roof structure above the audience there are 6 PCs which cannot be accessed. The installed dimmers have 24 channels in total and have DMX points in the lighting booth and the House Right disabled area. The DMX install is the wrong gender so a 5-pin male-male bender is required (Turner Sims owns one, it's grey and lives connected to the house desk). The dimmers are susceptible to crashing and can only be reset by E&F as they are in a locked plant room. The house LX stock is mainly PAR64 lights with a few other generic fixtures. The in-house desk is an LSC Atom 12. The house lights are a new install of DMX controllable LEDs. These are controlled by panels located USL, in the LX box or by DMX input to a box in back of the LX booth. There is a small hole between the LX booth and FOH for running cables. There is a working light over the centre of the stage controlled by a switch behind the stage door. The venue has rather limited power available. In the centre of the back wall (next to the organ) there is a distribution panel. It can provide a 32A feed or a 63A three-phase feed. The master breaker (grey MEM breaker) for both supplies is not designed to be switched under load. 13A sockets are available on the auditorium back wall, with 6 by the sound position and a single 13A to the house right side of each of the audience entrance doors. There are also 13A sockets under wooden floor panels in the stage floor; a 2-gang 13A socket is located with the main power outlets, and one 2-gang socket is located in the middle of the walls stage right and stage left (behind the row of seats). The sound install is minimal and requires a PA to be brought in for the events that we run. There are two loudspeakers mounted on the walls wither side of the stage, level with the front, at 10ft from the stage level. These loudspeakers only reproduce the very high end and have no bass at all; they terminate on jacks or bare ends on the floor underneath them. There are no installed amplifiers. If the D&B rig is used there is a set of C4 Props in the annex for propping the C4 tops to get better coverage of the raked seating. There is no useful installed XLR. The sound position is typically the middle of the back row of seats, a piece of deck is kept in the lighting booth for this (there are even specially cut legs for the different levels of seating). On stage there are 2 grand pianos and one harpsichord. As a general rule do not move these without asking. They are very expensive and Turner Sims would rather you don't. To get equipment onto the stage there is a goods lift around the side of the building with SWL 1 tonne. The bottom is level with the stage. The only double-door access to the instrument store for the Turner Sims and Musical Societies is through this lift. An important thing to note is that the fire escape route for part of the audience is across the stage and out of the backstage fire door, and this cannot be blocked.